We offer high quality Interior Signages. We manufacture interior signages which are used to identify a particular property or business. We present the images provided by clients in an eye catching and attractive way so as to make their image stand out. Our range of Internal Sign Boards is widely appreciated for its durability and easy installation. 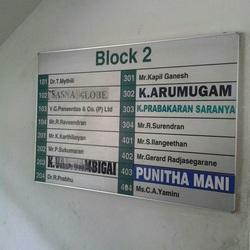 We are a leading manufacturer of Internal Sign Board in Delhi - NCR . We offer our products under the brand name" Promote India". Keeping the diverse requirements of the customers in mind, our company is involved in offering a superb quality range of Interior Signage Board. To meet the variegated demands of the clients, our company is instrumental in offering an excellent quality range of Interior Sign Board. In order to keep pace with never ending demands of clients, our company offers Interior Signage.